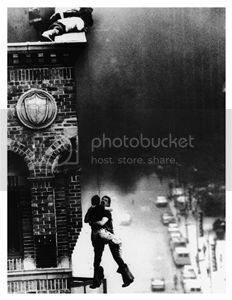 This site is about Firefighter Rescues. But, Proper Engine Company Operations are a huge part of making rescues/saving lives at fires. Below is a link to article on proper nozzle selection and Engine setup. SAGINAW, MI — A 61-year-old man was flown from a Saginaw hospital to a burn unit at Hurley Medical Center after he inhaled smoke while escaping a burning home in Saginaw. 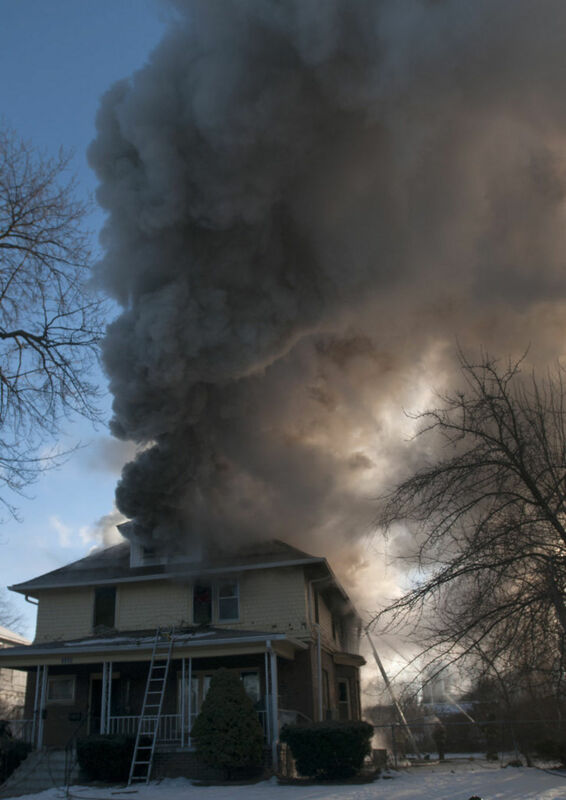 Firefighters responded to the call about a burning house about 8:10 a.m. Monday, Jan. 26, on Owen near East Holland, and the first responders saw two people on the roof of the porch yelling for help, officials said. 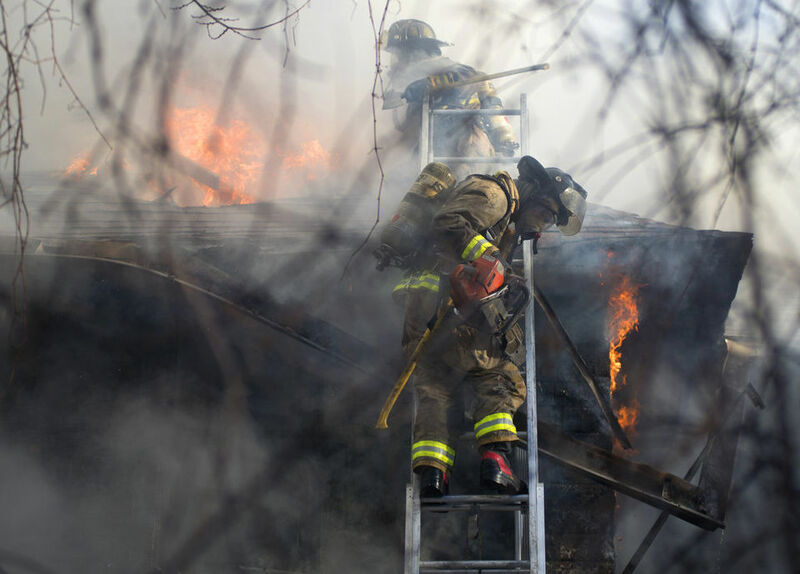 A firefighter positioned a ladder leading from the porch roof to the ground, allowing the two people, a 44-year-old woman and her 15-year-old son, to escape safely. 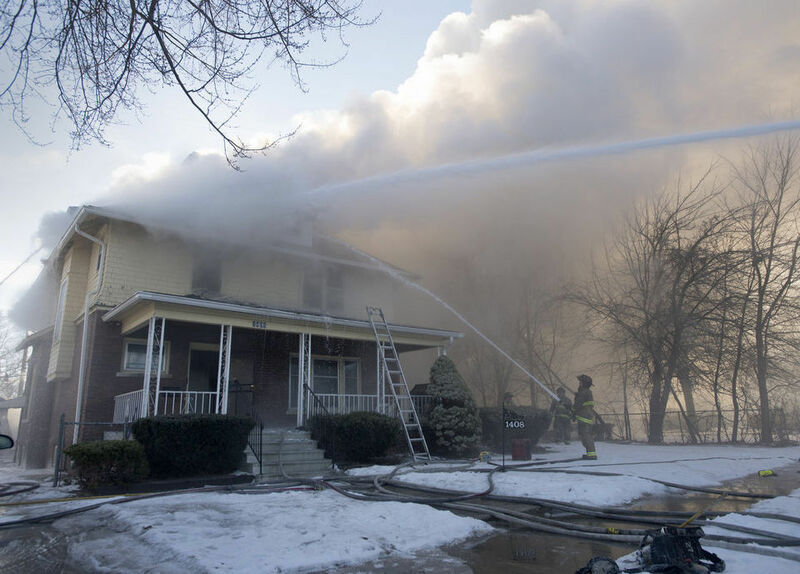 A 61-year-old man, who was inside the home on the first level when the blaze started, was initially treated for smoke inhalation at a Saginaw hospital and later airlifted for treatment at the burn unit at Hurley Medical Center in Flint, Fire Marshal Ralph Martin said. Officials could not give an update about the man’s condition. Martin said the woman on the porch roof was alerted by smoke detectors going off in the house. Investigators believe she may have went downstairs to alert the 61-year-old man before going back upstairs and becoming trapped as the fire spread, Martin said. Filary said officials believe the fire started in the kitchen area in the rear of the house. The “balloon style” construction was one factor that made the blaze a challenge to fight, he said, noting that the studs in some older homes go from the main level to the attic, allowing fires to spread quickly in the walls. After an initial knock down, firefighters were fighting from inside and outside the home, until the fire began again in the attic, prompting firefighters to evacuate the building. The house, valued at about $44,000, was a total loss, Filary said. Firefighters worked at the location for more than three hours, he said. The cause is under investigation. A firefighter suffered a minor ankle injury while on scene, Martin said, and he was checked out by medical workers. Firefighters always respond to get to a fire as quickly as possible, while taking weather conditions into account, Filary said, but if they learn someone is possibly trapped, it gives them a kick of adrenaline. 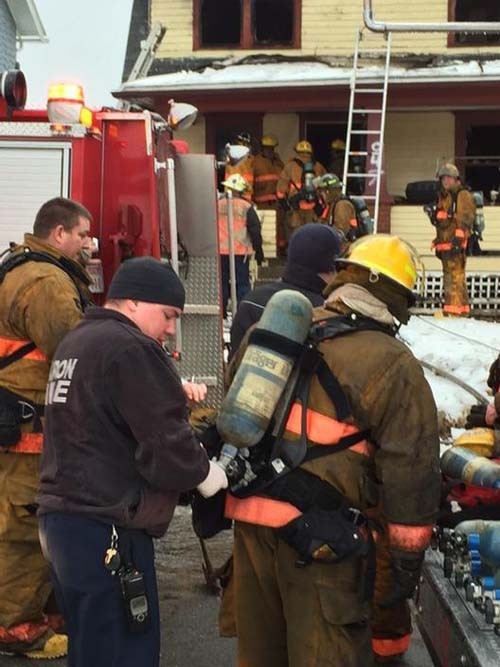 Akron firefighters rescued two women trapped inside a burning home Thursday morning. The women and a man who also was inside when the fire started were treated for injuries. 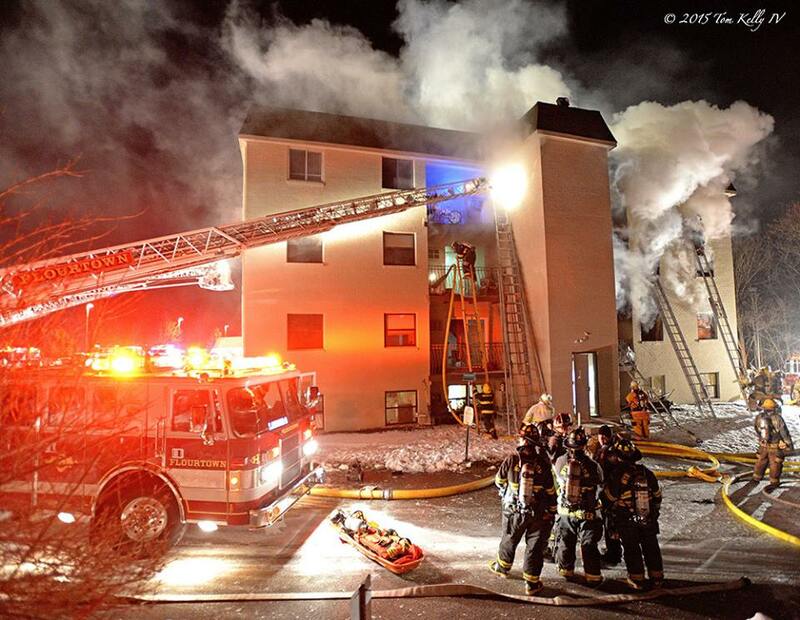 Seven Akron firefighters were also treated for either burns or smoke inhalation. 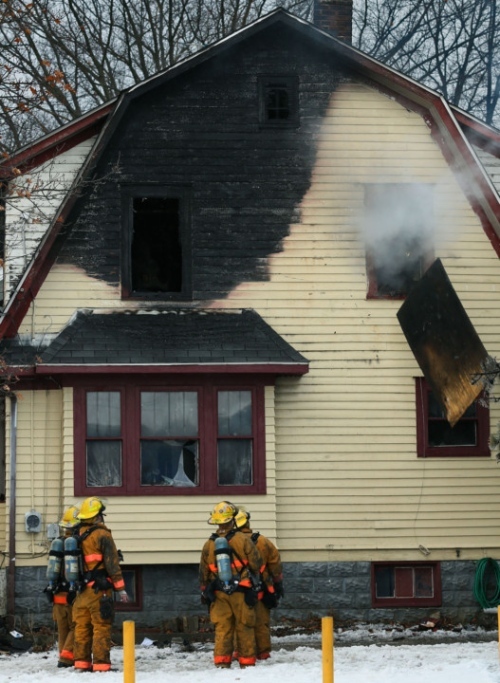 One resident, Roberta Melvin, suffered what fire officials described as severe burns. She was being treated at the burn unit of Akron Children’s Hospital. The other residents were treated for smoke inhalation. The names and conditions of the other residents were not immediately available. Three Akron firefighters suffered minor burns, while four other firefighters suffered from smoke inhalation. Some of the injured firefighters were taken to Akron General Medical Center. Firefighters were called to the home, in the 900 block of Barbara Avenue, just before 10 a.m., when a neighbor saw flames shooting out of the second-floor windows, said fire Inspector Sierjie Lash, who also serves as the department’s spokeswoman. In a 911 call released Thursday afternoon, a woman inside the house tells a dispatcher that she, her fiance and an older woman are trapped upstairs and that flames from the first floor were blocking their way to a staircase. “I just woke up and the bottom story of my house is on fire,” the woman tells the dispatcher. The woman coughs several times during the call while the dispatcher urges her to get as close to the floor as possible in order to breathe cleaner air. “This smoke is ridiculous,” the woman is heard saying. At one point, she tells her fiance to avoid going outside. “You can’t go outside. You’re not jumping outside,” she says just before fire trucks arrive. District Fire Chief Dennis Stoneman said firefighters arrived to see the man standing outside on a porch roof. Behind him, flames were stretching outside two upper-floor windows, and heavy smoke was billowing into the frozen rain falling outside. The man was rescued with a fire department ladder. Firefighters then made their way inside to the two women, who were trapped on the second floor amid the thick smoke and heavy flames. “The firefighters went inside to get them out, and there was a [fire] flash before they could take them down the ladder,” Stoneman said. Firefighters say the heat inside was so intense that it penetrated one firefighter’s jacket, causing burns to his back. An official cause of the fire has yet to be determined. Stoneman said it appears to be accidental. The Northeast Ohio chapter of the American Red Cross said it will be assisting the family. A 30-year-old man was airlifted to Stony Brook University Hospital for serious injuries sustained in a late-night house fire on Middle Road last night. A woman and two children escaped without injury from the second-floor apartment in the two-family house at 394 Middle Road, but the occupant of the first-floor apartment was found unconscious by firefighters, who pulled him from the burning dwelling, Riverhead Police said. One of the children who lives in the upstairs apartment called 911 at 11:24 p.m. to report smoke coming from the first floor of the home, police said. Police found Shanon Garcia-Donis, 32, with her 7-year-old child and 6-month-old infant standing outside the two-story wood frame house on fire. She told police the first-floor apartment was occupied and the resident may be inside. Riverhead firefighters found flames burning at the rear of the house, where the fire started in a kitchen stove, First Assistant Chief Kevin Brooks said. A hose team knocked down the fire so that two search teams could enter the house and search for occupants, he said. A fourth team climbed onto the roof to vent the fire, the chief said. Search team firefighters J.R. Renton and Kevin Burgess, both ex-captains, found the unconscious man on a sofa in the front room on the first floor and pulled him from the burning home. Brooks said. Police identified the victim as Matej Petrak. Firefighters found Petrak in less than a minute and got him out of the house, Brooks said. “They did an amazing job. They really struggled because he was a big man. But they got him out of there very fast,” he said. Details: Capt. 88 arrived on scene with fire showing from the second floor rear of a four story apartment building with people trapped on the upper floors. Ordered truck companies to go ladders to make rescues. Special call two additional ladders companies. Interior crews reported fire in one apartment on the second floor. EMS requested additional ambulances to assist. Fire extended to the third floor and had a partial collapse of the floor about the fire apartment. Multiple hand lines in service on the interior. EMS transported three people to the hospital, one with smoke inhalation. Crews made numerous rescues from balconies via ladders. 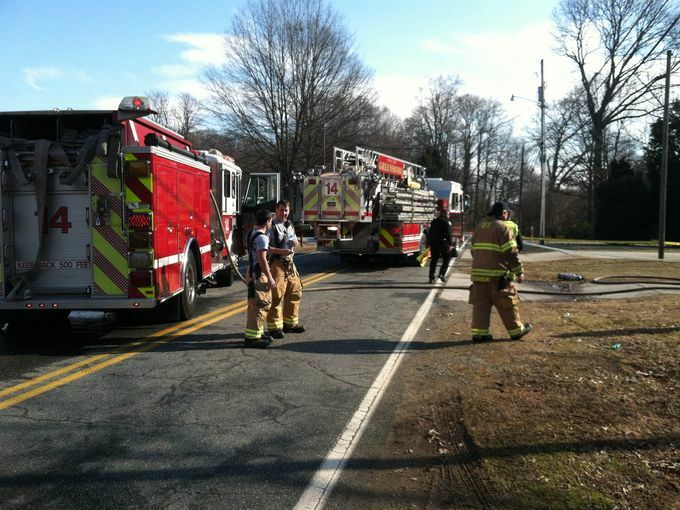 GREENSBORO, N.C.– Firefighters rescued a small child from a burning building on Monday morning. According to Chris Wilson with Guilford County Emergency Services, the young boy was transported to Moses Cone Hospital shortly after 10 A.M. He is currently listed in “serious” condition, according to Wilson. Battalion Chief Pat Henley said the fire broke out in an apartment in the 1400 block of Glenside Drive. Henley confirmed that the young boy was trapped inside and firefighters had to rescue him after arriving on scene. Neighbors like Terrence Lynch watched anxiously. Henley said the fire was extinguished within a matter of minutes. The cause of the fire is still under investigation. 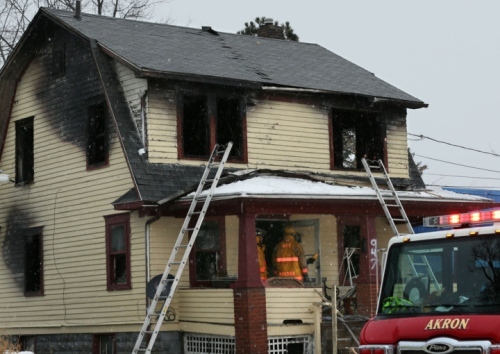 WORCESTER – As the blizzard raged on, Worcester firefighters battled a blaze overnight that destroyed a home on Alvarado Avenue and sent some people to the hospital with minor smoke inhalation issues. Firefighters rescued one pregnant woman from the home. Fire officials officials did not have an update on her condition Tuesday morning. 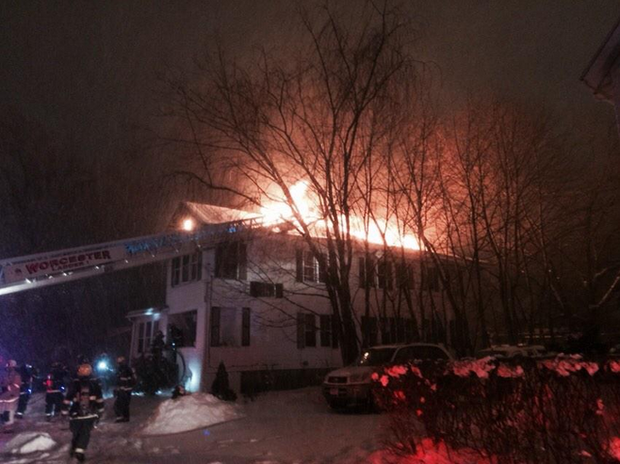 Just after 2 a.m., Worcester firefighters responded to a two-alarm fire at 20 Alvarado Avenue. City Manager Edward Augustus said a large family was living in the home. Seven people, including children, were rescued, he said. According to the Worcester firefighters union Twitter page, the attic of the home was fully engulfed in flames when they arrived. After a quick battle hampered by blizzard conditions, firefighters had to be evacuated from the home due to a roof collapse. Wind gusts proved to be a problem for firefighters as they tackled the fire. As the wind whipped through the air, the fire would reignite. 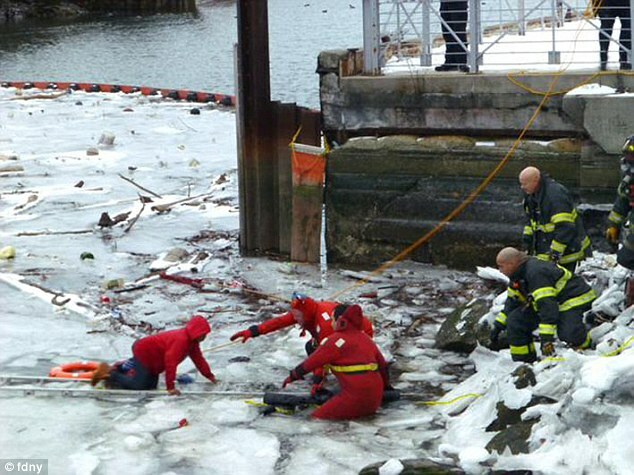 Officials said the cold temperatures left firefighters caked with ice. 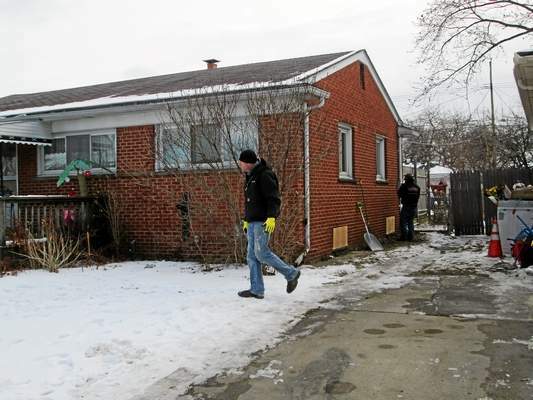 A Warren woman rescued by firefighters from her burning home remained in critical condition Monday afternoon. As Warren firefighters arrived at the ranch-style home Sunday morning on Dale Avenue, near Hoover and 11 Mile roads, police told them that family members said 38-year-old Jennifer Kasinski was still in the basement where she had living quarters. “The family couldn’t get to her because smoke and heat was coming up the stairs,” Warren Deputy Fire Chief Gary Wilkinson said. As one crew battled the flames in the basement amid thick, dark smoke, another searched for the woman and found her unconscious on the floor. She was not breathing and had no pulse when paramedics checked her moments after she was carried up the stairs by two firefighters. “They had their hands full (but) they found her pretty quick,” Wilkinson said. By the time Kasinski arrived at St. John Macomb-Oakland Hospital in Warren, she had a pulse and was breathing again. She was in critical condition and later transferred to Detroit Receiving Hospital for treatment of severe smoke inhalation. Her relatives were coughing after escaping the home and sought medical treatment on their own. No firefighters were injured in the incident. Kasinski resided in the home with her mother, stepfather and 19-year-old son. Her family members were asleep on the main floor of the house but were awakened by a smoke alarm at approximately 7 a.m. A smoke alarm in the basement had a battery but did not function properly, leading fire officials to believe that’s why the woman was unable to escape on her own. The basement was set up with a bedroom, small kitchen and a bathroom. Fire investigators do not suspect foul play in the incident. 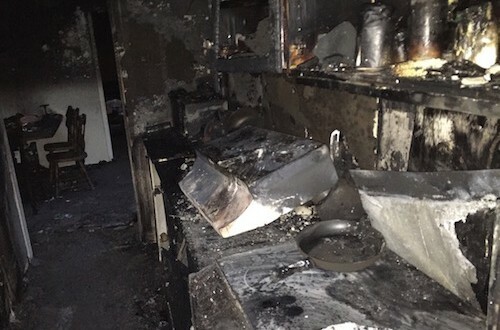 Officials believe the blaze started in a storage cabinet that concealed a power strip with several plugs connected to it, Wilkinson said. Wilkinson praised firefighters for their life-saving efforts Sunday. 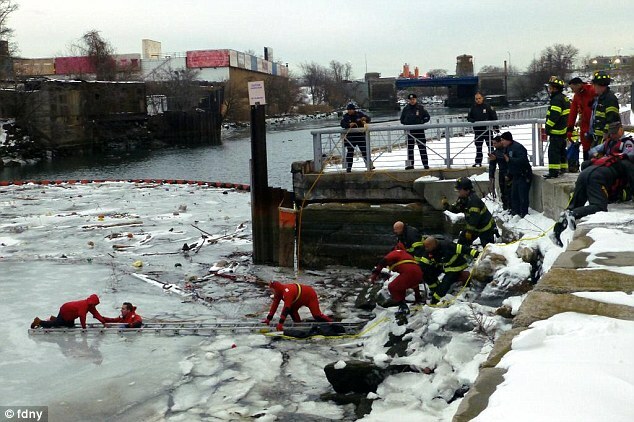 “The impressive part to me was they got her out so fast,” he said. 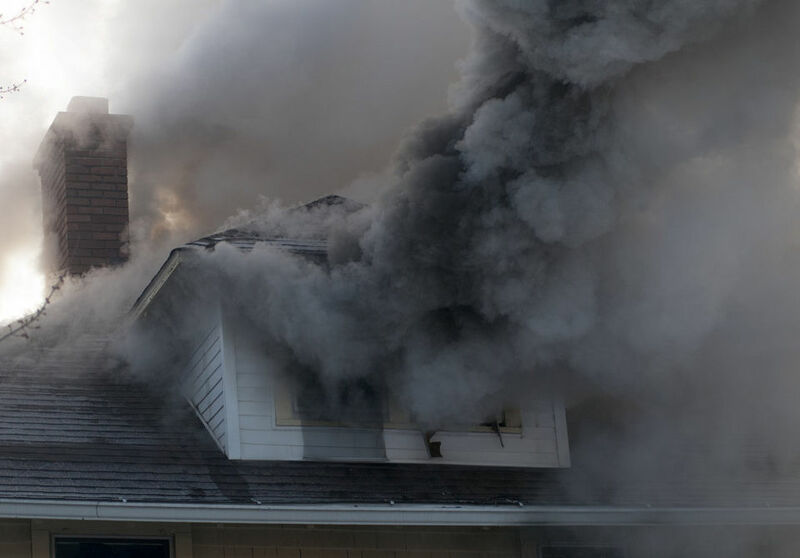 The deputy chief said firefighters searching a smoke-filled structure for victims –- often in little or no visibility — are trained to move along, and stay in contact with, walls to avoid becoming disorientated while trying to find a person on the floor. Sometimes, firefighters will extend their reach by using their feet to stay in contact with walls and using an axe or other tools to sweep along a floor to find anyone, he said.